No one in Robin’s family had ever served in the Armed Forces, so when she raised her right hand in 1996 to support and defend the constitution of the United States, she didn’t know exactly what she was getting into. Robin, already a college graduate, enlisted to repay her undergraduate student loans and planned to only stay a short time. A career logistician Robin has provided fuel, food, ammunition and maintenance support to soldiers and has thoroughly enjoyed a being a citizen of the world. 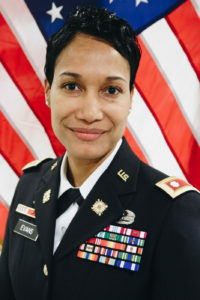 After 14 moves and 22 years later, with multiple deployments and leadership roles, she will retire as a Lieutenant Colonel. The Army has been the family Robin lacked growing up as an impoverished child in Kansas. When thinking about what career she would like to pursue after retirement her mind turned to one her of her early interests of practicing law. Robins experience with the adoption of her son from Ethiopia has made her a passionate advocate for both domestic and international adoption and the reforms needed to ensure needy foster and orphan children find forever homes. She hopes to start a nonprofit and use her law degree to create a way to ensure comprehensive pre-adoption education; accessible and meaningful post-adoption support; and the necessary credentialing and training of professionals who serve children and families in order to better understand the adoption and foster care experiences.